After six months of systematic confusion, disorientation and chaotic turmoil the Afar Region’s ruling single party of Afar Revolutionary Democratic Unity Front (ARDUF) logothe Region has convened its 6th Congress in the district city of Abaala, which is less than 50km far away from Mekele, the capital city of the Tigray Region. For more than two decades, the Afar people’s fate and destiny seems to be decided in the Mekele rather than in the Federal Republic capital city of Addis Ababa. The Afar People have been suffering from endless bad governance, corruption, biased judicial system, tribalism, poverty, economic and social marginalization and human rights violations at the hands of the TPLF/EPRDF regime and its Afar puppet ruling clique. In the Afar Regional State Congress the most feared and respected guest of honour was none but Ato Abay Woldu himself and the red carpet was rolled out for him and for than the representative of the EPRDF “Ato Kebde Tchane” a Head of EPRDF Political Bureau, because it is Ato Abay Woldu who was the immediate boss of the Afar errand boys who were members of the TPLF until 1991, when they were assigned to rule the Afar in the mission of their TPLF lords. The Afar region was supposed to change or substitute the old leaderships with new more-educated, skilled and democratically chosen representatives, but there very little change occurred in the top of the regional administration. Only Ismael Ali Sirro who ruled the region for more than 18 years has left for Addis Ababa to join the Federal Parliament and side by side and he is to take the position of Ato Tsegaye Berhe, as the Security Advisor of the Prime Minister. The Afar population is expecting no better days nor much sought after change as the new President of the Region comes after being responsible for the heading the Security Bureau in the region for more than two decades. “Hajji Suyyum’s” this how he likes to be called first acts and formation of the regional government does not herald good neither for our people or region as is not only equally notorious like the Somali Region’s President Mr. Abdi Mohamed Omar, but also controls and commands just like his Somali counterpart a notorious Liyu Hayle “New Police Force” composed of members of his immediate family. This is what we call a change for better or a democratic substitution of generations, Afar Region style. In spite of the current severe famine crises facing Afar people, APDPA (local “Aggar Party) the Afar regional party has its share fanfare and wasteful spending, while the Afar Region (Killil) remains one of the hardest-hit and badly affected areas by the current famine more than any regions in Ethiopia. We realize that the political landscape is extremely complex and the recent developments in our country Ethiopia and our region is critically passing through unprecedented situation, such as unlawful killings of innocent students in the Oromo region, forcible eviction and displacement of Indigenous peoples from their traditional grazing areas and water resources, gross human rights violations, destructive Master Plan, Gonder uprising and border demarcation, the recent uprising in all four corners of Oromia that engulfed the country, the oppositions parties and groups could not so far translate the motto OUR STRUGGLE SHOULD ONE AS OUR OPPRESSOR IS ONE INTO REAL ACTION. 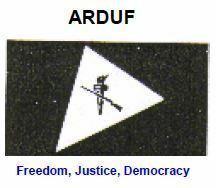 We can confirm that ARDUF is an independent political, economic, social and cultural organization fighting for realization of the inalienable rights of the Afar people to self-determination within the united federal democratic republic of Ethiopia. ARDUF does not have Offices and Representatives in the western capital cities in the DAISPORA. We in the ARDUF leadership are more than ready to contribute our part by joining all opposition forces in Ethiopia to prevent the country from heading toward a destructive political calamity by eliminating the TPLF-led repressive regime.